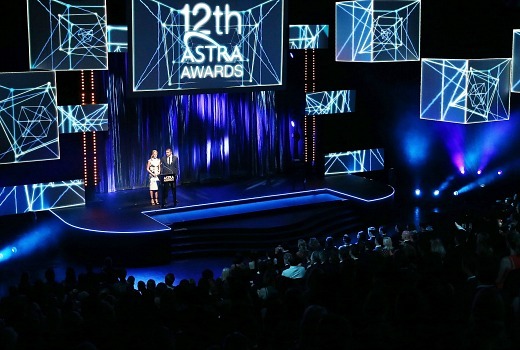 Selling Houses Australia, Wentworth, SKY News and Showcase were amongst the big winners at last night’s 12the ASTRA Awards at Carriageworks. Showcase won the top gong for the night, the Channel of the Year, presented by Days of our Lives stars Kristian Alfonso and Shawn Christian. But it was the ever-popular Selling Houses Australia that walked away with the night, bagging Favourite Australian Program plus Favourite Australian Male and Female for Andrew Winter and Shaynna Blaze, respectively. Drama debut Wentworth defeated Top of the Lake as Most Outstanding Drama and Nicole da Silva won Most Outstanding Performance by an Actor: Female. Peter Mulan from Top of the Lake won the Male equivalent. Factual Program with The People Speak. 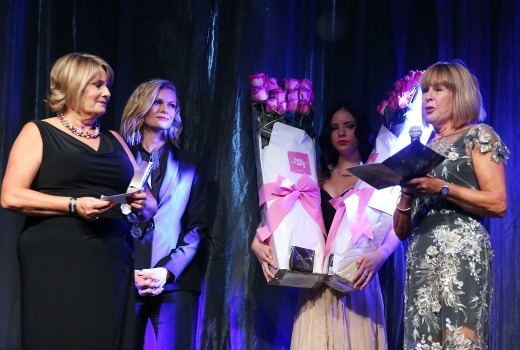 The evening included a tribute to Charlotte Dawson, presented by Jennifer Hawkings and Didier Cohen. Sarah Murdoch presented a posthumous award to her sisters, Vicky Dawson and Robin Barclay with a moving video tribute to here many years across both STV and Free to Air television. The evening was hosted by Shaynna Blaze and Matt Shirvington who opened with Blaze singing up a storm -she impressed everybody in the room (who knew she could sing too?). Amongst the presenters were Kerri-Anne Kennerley, Robbie Magasiva, Sam Moran, Danny Clayton, Marcia Hines, Israel Folau, Brendan Moar, David Speers, Matt Moran and Neil Oliver. Marty Smiley from Channel [V]’s The Riff spoke about some 300 shows produced last year. “Just spare a thought for us. We have to do live coverage of Miley Cyrus twerking,” he said. “You talk about it as if it’s not an important subject Marty, come on,” Danny Clayton interjected. But it was Jennifer Hawkins who had the line of the night, after Real Housewives resident psychic Jackie Gillies tipped Australia’s Next Top Model to win an award. After winning Most Outstanding Reality Program, Hawkins commended her on her “psycho” skills. At one stage guests were asked to trim their acceptance speeches after Fraser Stark from the History Channel thanked a long list of supporters. Paul Murray served as backstage host, with several interviews appearing on the big screen during the show. He managed to get an insight into the Prime Minister’s via one of Tony Abbott’s daughters. While Margie Abbott is a bit a “remote hog” for LifeStyle property shows, both the PM and his wife are fans of Downton Abbey. Musical performers included The McClymonts and Timomatic. But once again it was the Candy Bar at the After Party that proved to be a big hit with guests. @Victor I agree. I never understood the appeal of Wentworth. It was completely soulless. You neglected to mention what song Shaynna sang. But I hope it was “That don’t impress me much”. It was a parody of I Will Survive and Happy. Ok. Well the only name on this page that I know is David Knox! So I’m nominating you for an award! I’ve had better holidays every year since with the money saved after cancelling when Optus threw in the towel! Still good that you can include this content in the site David. Wentworth – Most outstanding drama!!!! Has PAYTV really now scraped the bottom of a very shallow barrel? Sad. Wentworth was obviously going to win Australian Drama. Firstly its Australian, it is more recent and was much more popular. Top Of The Lake was a niche drama shot in NZ with an American star (doing a bad accent). And Game of Thrones couldn’t win because Foxtel puts it in the movie package reducing its audience. Shaynna trained as a singer and has decent pipes. She’s come a long way from her dodgy audition tape for Selling Houses 8 or 9 years ago. I remain amazed at the giddy heights to which she has ascended. Terrible decision overlooking Elisabeth Moss. I expect the ‘organisers’ decided it wouldn’t look good to not have either Most Outstanding Male and Female attend…..so they gave it to da Silva…. she was always going to turn up. I was on the record yesterday as saying I thought TOTL should get Outstanding Drama and Wentworth get Favourite Aussie Program. I like both but that was just how I saw it. Congrats to all winners. How can she be a “new” talent after spending 10 years working at Channel 10?